Several major classes of technology stand a good chance of changing healthcare as we know it. Home healthcare, in particular, could see tremendous benefits from digital breakthroughs like the Internet of Things, more advanced medical-minded wearables, blockchain and artificial intelligence. All of this tech is already finding a home in a variety of types of medicine — let’s take a look at how. If you follow the money, you’ll find a lot of excitement in the healthcare wearables market — 14.41 billion dollars’ worth of excitement, in fact. That’s how much this entire healthcare category is expected to be worth by the year 2022. Think wearables are already passé? You’re forgiven if you’ve had to add “step tracking fatigue” to your list of pre-existing conditions. But the truth is, we’ve only just gotten started with this market. Apparently, the electrocardiogram feature in Apple’s latest wristwatch didn’t receive regulatory approval until a few days before its public unveiling. Even now, it’s a U.S.-exclusive feature. That’s partially a criticism of how quickly regulation happens these days and partly a warning about how fast technology moves. It’s moving so fast that the FDA rewrote how it goes about approving such devices — but more on that in a moment. Doctors across the world are likewise experimenting with newer technologies when it comes to diagnostic, pediatric and specialist medicine. Google Glass has found an unlikely home in doctors’ practices, for example, by providing an unobtrusive way for doctors to keep files and reminders about the patient they’re seeing, or about to see, literally in their peripheral vision. 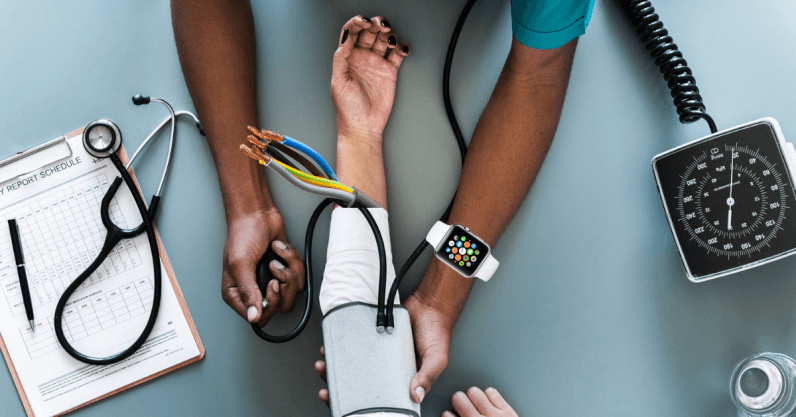 That’s wearables at work in healthcare — so is the proliferation of APIs allowing patients to seamlessly and remotely share health data and records with their physicians. This includes all those step counts, as well as ongoing heart rate measurements, blood pressure readings and more. Bigger companies like Apple and Samsung want their first-party apps to be those APIs. However, there’s a lot of incoming competition in this market — some of which piggybacks on the technologies included in our phones, watches, fitness bands and, reportedly, soon our headphones. These tools offer new ways for patients and doctors to interact with health data now that the hardware has made it more “visible” to interested parties. Some of the reluctance to adopt technology into our lives — and into something as vital as our healthcare — may be attributed to privacy and security concerns, and that’s understandable. The good news is, lots of the IoT devices and a great deal of the healthcare apps and devices coming through the pipeline should be a great deal more secure now that blockchain is coming into its own. This is welcome news, as well, since the FDA is overhauling — by “streamlining” and “encouraging innovation” — the process where it approves medical devices on their way to store shelves. It’s an important job that sees the administration weighing the benefits and the risks of thousands of devices per year, a portion of which is variations on, or enhancements to, existing products. One of the problems with having so many potentially unsecured medical devices cleared for sale is, to return to the subject at hand, security. The IoT is famously insecure against a variety of cyber-based crimes — and that’s what makes blockchain so timely and important for home healthcare. The entire point of moving to Electronic Health Records was to make our medical histories and all our patient data more mobile. But, as we choose health plans, primary care physicians, medical facilities, rehabilitation clinics and at-home connected technologies, such as wearables, you begin to see why there’d be hesitation among patients, as well as health system decision-makers to cast such a wide net and bait it with such tempting data. Health records are, according to cybersecurity experts, some of the most valuable pieces of data that criminals can make off with. Applying blockchain to the transmission and storage of health records means decentralizing stored data and engaging in “trustless” information exchanges. More simply, blockchain in healthcare will make it fundamentally faster and more secure for all the “stakeholders” engaged in a particular patient’s progress to collaborate securely on imaging projects, data analysis and other processes. One of the ways in which the accumulation of patient health data — from wearables as well as from each person’s Electronic Health Record (EHR) — becomes useful for patients is through artificial intelligence. AI’s potential in healthcare administration goes well beyond the patient level, too, and could soon help hospital systems everywhere administer care more efficiently, with shorter wait times and fewer wasted resources. The focus here is on home healthcare, so let’s begin with one of the most stubborn problems in medicine: underserved communities, such as rural areas without reliable access to doctors, as well as patients who are homebound, bedridden or otherwise unable to travel regularly to attend doctors’ consultations. In cases like these and many more, achieving accurate diagnoses as quickly as possible is vital to eliminate as many back-and-forth journeys for patients as possible, and perhaps even avoid some in-person visits altogether. Many companies have emerged, promising their AI solutions are faster and better than doctors at diagnosing some conditions. Tencent’ artificial intelligence can reportedly diagnose Parkinson’s disease in a matter of minutes. Then, there’s a company called Babylon, whose chatbot can reportedly mimic doctors well enough in digital conversations with patients that — according to its creators — it can make diagnoses faster than “real” doctors can. For patients who find themselves, regrettably, truly at the end of their medical options, AI is showing promise in meeting a great deal of unmet need where clinical trials are concerned. Experiments like these are, by definition, unproven, but for many desperate patients, they represent a potential lifeline as the study of new treatments and drugs benefits from further participation. Amazingly, though, according to IBM, fewer than 5 percent of adults diagnosed with cancer take part in clinical trials — despite 20 percent of cancer trials ending prematurely due to insufficient participation. In Europe, likewise, just a few thousand patients are approved for clinical trials in an average year, despite new cancer diagnoses now in excess of 4 million per year. Expect AI to play an even more significant role in connecting the right kind of patient with the right type of trial. And not just for cancer, either — tests are regularly available that study promising new avenues in the treatment of Alzheimer’s, diabetes, autism, heart disease and more. Although these are all breakthroughs in technology, this has been just a taste of what’s to come. As we begin to better understand AI and the many possible applications of blockchain, expect healthcare to become even more social, mobile, collaborative and, most importantly, effective.